One day after Hurricane Irma tore through Miami, workers were back on the job of renovating the north side of Miracle Mile, said Javier Betancourt, director of the Coral Gables Economic Development Department. The south side of Miracle Mile and the Giralda Avenue component of the project are done, he added. In celebration, the city and the Coral Gables Business Improvement District will host a party Oct. 13 in Giralda Plaza, the pedestrian mall on Giralda Avenue that was created as part of the project. The mall will remain closed to vehicles as part of a two-year pilot project, which was requested by businesses there, the streetscape’s website said. The renovation widened sidewalks, which were then covered with grey and blue hand-cut stone pavers. Diseased trees were removed and replaced; parallel parking replaced angle spaces. Long-standing drainage issues were addressed, and high-speed fiber and specialty lighting added. 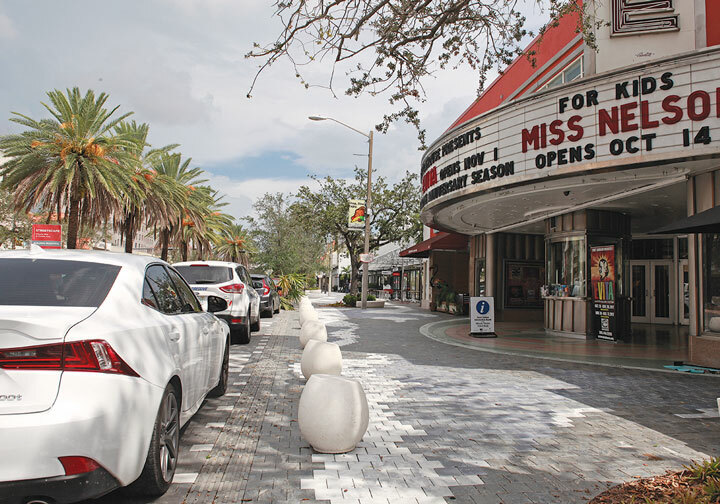 “The goal of the project is to enhance the economic vitality of the downtown Coral Gables district by transforming some of the city’s main commercial streets, Miracle Mile and Giralda Avenue,” said the project’s website. “The improvements are intended to provide a cohesive pedestrian-friendly experience with garden areas, outdoor dining, improved lighting, way finding, public art and more. Completion of the last three blocks on the north side of Miracle Mile (those closest to Douglas Road) is set for no later than January, Mr. Betancourt said. Crosswalks are also being installed all along Miracle Mile.